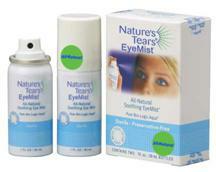 Natures Tears® EyeMist® - What Causes Surfer’s Eye? 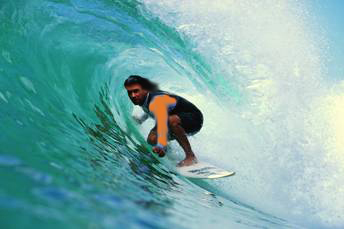 “Pterygium” is to the sport of wave surfing what tennis elbow is to tennis. In short, you don’t want any part of it and a wise surfer will do whatever it takes to avoid it. Make no mistake, if you are a surfer, you are definitely at risk. If you are a surfer who experiences frequent eye discomfort (as most do), and who uses no eye protection, you could be at extreme risk. The word pterygium is Greek for “wing.” Pterygium can occur elsewhere on the body but we are concerned here only with “conjunctival pterygium” of the eyes. “Conjunctival pterygium” refers to a wing-like membrane that begins growing near the “conjunctiva” (the corner of the eye near the nose) and gradually works its way towards the cornea (the eye’s clear portion), covering more and more of the eyeball as it progresses. Once the membrane reaches the cornea, vision can be impaired. Although considered “benign” (not life or health threatening), the condition can cause extreme eye discomfort including itching, burning and other symptoms. It is also very unsightly. While the discomfort can be relieved, and the progress of the growth can be arrested, the condition can only be reversed through surgery. Pterygiumis believed to be caused by prolonged exposure to ultraviolet (UV) radiation, intensified by reflection off the water (snow skiers are also susceptible but usually wear sunglasses). The UV exposure is made worse by simultaneous exposure to several factors that could impair the protective ability of the eye’s all-important “tear film.” Wind, solar radiation, and the bacteria and microorganisms found in sea water are all known to cause the tear film to lose moisture. This moisture loss leads to a condition called dry eye syndrome, whose symptoms are identical to the discomfort leading to pterygium (see box). When the tear film loses moisture, tear salt becomes over-concentrated and starts to act as an irritant. Frequent exposure to salt water could heighten this effect. Dry Eye and the All-Important Tear Film. The lipid layer is on top and consists of a mix of fats and oils produced in the eyelid’s meibomium glands. The extremely thin layer lubricates the eyelids and slows evaporation from the much thicker underlying aqueous layer. The aqueous layer is 98% water and contains tears produced in the lachrymal glands. The function is to form a light-transmitting cover over the cornea. The layer also contains hormones, enzymes, proteins and antibodies. 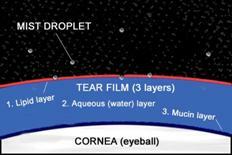 The mucin layer, at the very bottom, adheres the tear film to the eyeball. Numerous environmental factors, including bacteria, UV radiation, wind, dust, airborne sand, air pollution, air-conditioning and much more, can cause evaporation that results in slight, moderate or even severe aqueous layer moisture (water) loss, known as “dehydration” or “dry eye.” When eyes are simultaneously exposed to several strongly dehydrating factors, as is often the case with surfers, discomfort is experienced, small lesions begin to appear on the corneal surface and the tear film cannot function normally. Keep this up and conditions are in place for pteygium. Fortunately, everything but the actual pterygium growth are immediately reversed once tear film moisture is replenished. 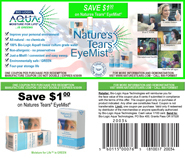 Bio-Logic Aqua Research has discovered that the best (and least expensive) way to mitigate the effect of irritants on the eyes is to pay attention to your tear film’s natural moisture content. The standard method of alleviating dry eye symptoms is to apply chemically formulated eye drops and redness relievers. While these products can be beneficial in helping seal in existing moisture, they are not always well tolerated. Drops do not add water, or any other natural ingredient, to the tear film. Individual drops are so large that they can flood the tear film and wash away protective factors such as the evaporation-slowing lipid layer and bacteria-fighting antibodies. Many people experience an allergic reaction to the chemicals and preservatives in eye drops. Drops can be difficult and uncomfortable to apply and are often avoided. Drops may only be safely applied a specified number of times a day. Over-application may cause an allergic or addictive reaction. A newly discovered alternative method of soothing dry irritated eyes (that is also more natural, safe and environmentally green), and of mitigating dehydrating environmental challenges to the eye, is to simply add pure, fresh, pH-balanced humidity to the air around the eyes, using a personal portable misting device. The humid mist will find its way into the tear film’s aqueous (water) layer in just the right amount (two-to-five nanoliters) to help alleviate symptoms naturally, without drops or chemical formulations. The problem has been finding a way to bottle the natural, fresh, beneficial humidity of a spring rain and apply it to the eyes. This was finally solved by Bio-Logic Aqua Research. The result is Nature’s Tears EyeMist with the uniquely biocompatible “Bio-Logic Aqua tissue-culture grade water.” A specially designed mist applicator breaks the water into micron-sized droplets (patent pending) that duplicate natural humidity no matter what the surrounding environmental conditions. Because Nature’s Tears EyeMist contains no harmful propellants, preservatives or chemicals, it can be safely applied whenever discomfort is felt. Application several times a day can help lessen the severity of reactions to UV, sun and salt-water exposure. Nature’s Tears EyeMist should be applied to replenish lost natural eye moisture prior to applying eye drops, or to keep the tear film moist between allowable dye drop doses. Surfers should use it before entering the water and after every surfing run. Although everyone is susceptible to tear film dehydration, if you are a surfer, you should pay extra attention tear film health, not only when surfing but always. A healthy tear film at home can better fight off extreme challenges at the beach. Always wear eye protection when in the water (tinted, water-tight goggles). Wear sunglasses on the beach. Take a shower, and/or wash your eyes with a warm compress, as soon as possible after surfing. Set out bowls of water in your house to humidify the air, especially when the heater or air-conditioner is on. Treat yourself to frequent long, luxuriant baths and/or showers (a brief shower after a bath will wash off residue). Make a ritual of daily facial cleansing. Using a washcloth and very mild, liquid soap, apply hot water compresses to your eyes and face, with eyes open. Do this four times for 30 to 60 seconds each time (It’s VERY relaxing!). This moisturizes not only the tear film but the eyelid skin, where the glands that produce many tear film components are located. Let as much fresh air into the house as you can, especially in the bedroom and bathroom. Keep Nature’s Tears EyeMist in your bathroom, car, locker room, and with you at the beach. Use it before and after cleansing your face in the morning, before each eye drop application, after every surfing run, and during the day whenever eye discomfort is experienced. Be sure to contact us is you have ANY questions!